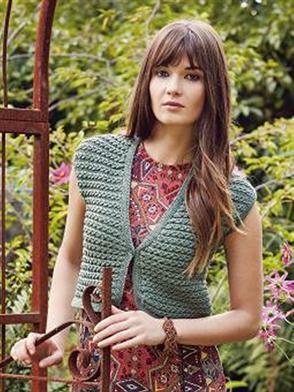 Taken from Rowan: "Knit this cropped short sleeve cardigan by Marie Wallin from the Softyak DK collection. The pattern is worked sideways in an all over texture and has a shaped hem. It would be suitable for the knitter with some experience." This pattern is from Rowan, Softyak DK, by Marie Wallin. Needles required but not included: US 3, and US 6 straight. US 3-24" circular. US 3 DPN. Adjust needle size if necessary to obtain the correct gauge. Notions required but not included: One 1/2" button and a yarn needle. Finished Bust Measurements: 32-24, 36-38, 40-42, 44-46" after blocking. Gauge: 30 sts and 28 rows over 4" in pattern. Color Shown is Lawn 241. $64.75 -- Kit price including yarn only (no book or pattern). $77.70 -- Kit price including yarn only (no book or pattern). $90.65 -- Kit price including yarn only (no book or pattern). $116.55 -- Kit price including yarn only (no book or pattern). If you like the Rowan Softyak DK Pema Cardigan kit, then you may be interested in some other kits covered in our Spring, Summer, and Fall collections.